Shot on the cusp of a massive wind and rain storm. Birds wheeling in massive flocks, trying to find stable trees to land on. The barometer dropping and dropping. That weird ozone feel to the air, like you haven’t entirely awakened…and you know it. The air takes on a slight metallic taste. At this point, the wind hasn’t really started, but it’s on the way. Shortly. I ride the bus most workdays, but I seldom shoot from the windows. People become uneasy when you take out a camera on public transportation—it’s an artificially private zone, and a camera violates that anonymity (no matter how great Walker Evans is). This, however, I couldn’t pass up. Storms may be massively destructive—and this one did its damage—but the skies…the skies become stunning. To my eye, the thick, dirty bus windows and reflections seemed to add to that feeling of unreality. It feels like a cross between a dream memory and a frame from a Wim Wenders film—low, fast-moving clouds and the magic hour. There’s a lot wrong with the image. A second earlier or later might have made it a better composition. The exposure’s off. But it kind of works because it’s wrong. It’s close to what my eyes saw, as they saw it. And the image has not been tweaked, other than some sharpening and clarity applied. I’ve been through worse storms (including a couple of hurricanes), but, still, I knew I’d never see this view the same way, and I pass it five days per week: exhilarating, with just a hint of fear. Where the best pics come from. 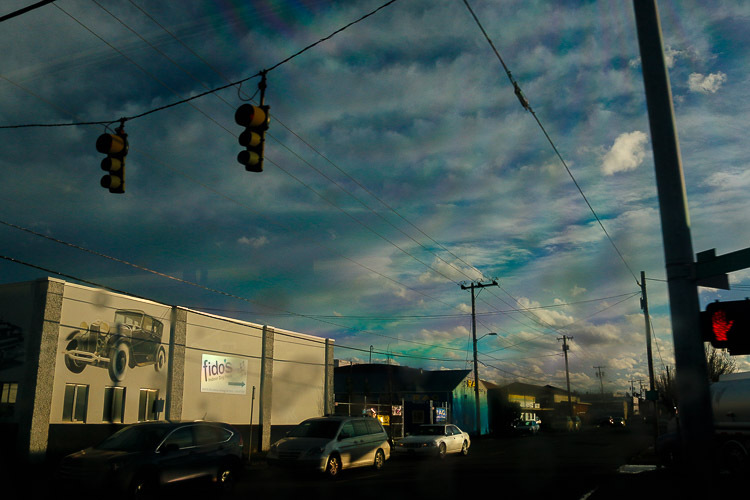 This entry was posted on Sunday, March 29th, 2015 at 8:56 pm	and tagged with Canon 70D, magic hour, photography, Portland, storm, surrealism and posted in art, photographs, photography, surrealism. You can follow any responses to this entry through the RSS 2.0 feed.